Corporate Cultural Diplomacy (CCD) activities are privately funded programs that encourage the exchange of cultural practices and values; ultimately promoting inter-cultural dialogue and respect. 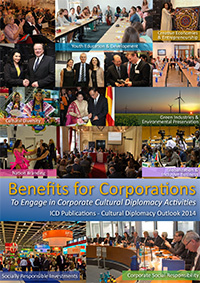 Corporate Cultural Diplomacy activities cover a wide spectrum of diverse fields and stakeholders. Examples of corporations engaging in CCD activities include intercultural exchange programs and activities in the fields of: education, art, sports, music, film and academic and scientific research. As the global transition towards more socially responsible business practices gains momentum, the ability to understand and embrace the different values and needs of diverse cultures and societies becomes ever more important. In addition, the ever-accelerating process of globalization is influencing every aspect of business today and the quality of relations between different cultures has never been more essential to the prosperity of both business and society. Therefore engagement in Corporate Cultural Diplomacy can significantly complement the successful performance of corporations and become a “must” in corporate development strategies of the future. The Role of International Corporations in International Relations - The expansion of companies abroad opens up opportunities for improving dialogue, understanding and trust across cultures. Companies operating internationally are generally associated with the values and beliefs of the country they are incorporated in and their workforce will, at some level, include citizens of this country. By conducting responsible activity in local communities these companies are therefore helping to influence how their country is understood and viewed abroad. CSR Activity brings together International and local Partners - Successful CSR activity will involve the cooperation of company employees with local partners and necessitates dialogue between local citizens, company employees, and local officials. The process of developing, planning, and executing CSR projects therefore facilitates intercultural interaction and the sharing of values, opinions, and experiences for a common goal. Economic Bridges require both CSR and Cultural Diplomacy - Companies that expand internationally must combine both corporate social responsibility activity with cultural diplomacy activity in order to be successful. Corporate social responsibility activities is required to generate a positive reputation and brand awareness in the target country and minimizing potential damage to the local community. Cultural diplomacy is required to ensure that the intentions and activity of the company are understood correctly, and that the company is fully aware of the cultural values and beliefs of the local community before that being to conduct business there. There are many reasons why private companies need to be aware of the differences between cultures in their strategic decision-making process and adopt cultural diplomacy models into the corporate agenda through their CSR departments. In the era of growing social awareness, corporations with culturally sensitive marketing plans and campaigns will enjoy a positive public opinion and good image, thus financially perform better. Companies seeking to expand abroad have a high likelihood of encountering problems unless they conduct research into and act according to the cultural differences of the host country.